The new metallic-organic framework, NU-1301, is made up of uranium oxide nodes and tricarboxylate organic linkers. Image courtesy of Northwestern University. Two firsts in science came about because of a near-dare. According to Nigel Browning at Pacific Northwest National Laboratory, “Omar Farha was giving a presentation on MOFs [metal-organic frameworks] and someone said ‘I bet you couldn’t make one out of uranium.’” Farha took the challenge and proved them wrong. In designing the uranium-laden frameworks, PNNL scientists Dr. Nigel Browning and Dr. Layla Mehdi helped Farha and his colleagues at Northwestern University overcome a troubling bottleneck in imaging the material. 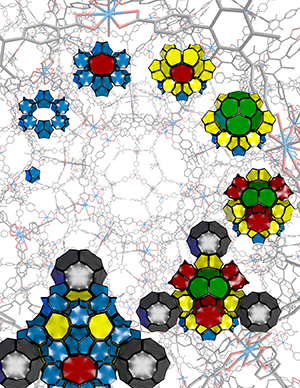 Before this study, scientists used x-ray analysis and modeling to map out MOF structures. The approaches come with sharp drawbacks. Browning and Mehdi showed that low-dose imaging is a viable option for MOF imaging, allowing for the structure to be resolved at the near-atomic level. This collaborative effort produced two notable milestones; it was first MOF made out of uranium, and the first time low-dose electron microscopy was used to map the MOF structure. Pacific Northwest National Laboratory (PNNL) is one of the United States Department of Energy National Laboratories, managed by the Department of Energy’s Office of Science. The main campus of the laboratory is in Richland, Washington. PNNL scientists conduct basic and applied research and development to strengthen U.S. scientific foundations for fundamental research and innovation; prevent and counter acts of terrorism through applied research in information analysis, cyber security, and the nonproliferation of weapons of mass destruction; increase the U.S. energy capacity and reduce dependence on imported oil; and reduce the effects of human activity on the environment. PNNL has been operated by Battelle Memorial Institute since 1965. 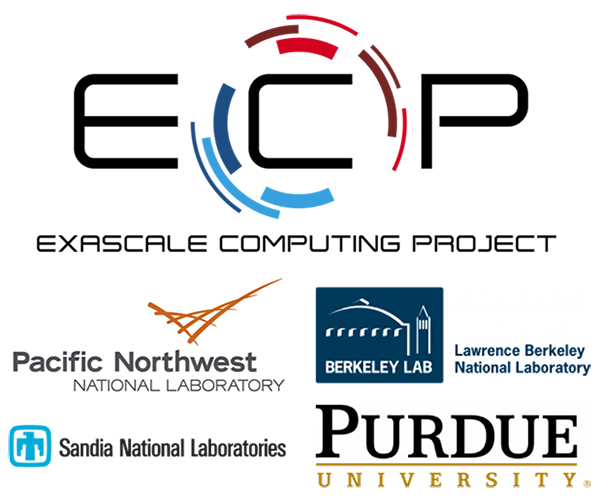 Recently, a PNNL-led proposal, “ExaGraph: Combinatorial Methods for Enabling Exascale Applications,” was selected as the fifth Exascale Computing Project (ECP) Co-Design Center. The center will focus on graph analytics, primarily combinatorial (graph) kernels. These kernels can access computing system resources to enhance data analytic computing applications but are among the most difficult to implement on parallel systems. Mahantesh Halappanavar, the Analytics and Algorithms Team Lead with ACMD Division’s Data Sciences group, will lead the center with Aydin Buluç, from Lawrence Berkeley National Laboratory; Erik Boman, of Sandia National Laboratories; and Alex Pothen, from Purdue University, serving as co-principal investigators. According to Halappanavar, the center will tackle developing key combinatorial algorithms arising from several exascale application domains such as power grid, computational chemistry, computational biology, and climate science. These applications and their respective growing data volumes increasingly pose an unprecedented need for larger computational resources to solve problems. This complexity will drive selection of kernels and their integration among software tools. To start, the intent is to work with the scientists involved in related ECP projects, such as NWChemEx, to fine-tune software tools that will perform on current and future extreme-scale systems, as well as enhance scientific discovery by providing more computation and flexibility to do what is needed for large volumes of data. “In the end, the applications will need to benefit from the tools that incorporate the algorithms targeted for exascale architectures,” Halappanavar explained. As part of the four-year project, the ExaGraph Co-Design Center will investigate a diversity of data analytic computational motifs, including graph traversals, graph matching and coloring, graph clustering and partitioning, parallel mixed-integer programs, and ordering and scheduling algorithms. Beyond its initial launch, Halappanavar noted the ExaGraph Co-Design Center aims to deliver a software library. The library will feature a set of frameworks that implement combinatorial kernels that can communicate with each other to enable scientific computing, which further empowers basic science research. In addition, Adolfy Hoisie, PNNL’s Chief Scientist for Computing and Laboratory Fellow, explained that having a PNNL-led ECP Co-Design Center that takes advantage of Halappanavar’s considerable expertise and unites some key collaborators is a welcome and synergistic addition to the laboratory’s research landscape and capabilities. The U.S. Department of Energy’s Exascale Computing Project is responsible for developing the strategy, aligning the resources, and conducting the R&D necessary to achieve the nation’s imperative of delivering exascale computing by 2021. ECP’s mission is to ensure all the necessary pieces are in place for the first exascale systems—an ecosystem that includes mission critical applications, software stack, hardware architecture, advanced system engineering and hardware components to enable fully functional, capable exascale computing environments critical to national security, scientific discovery, and a strong U.S. economy. The ECP is a collaborative project of two U.S. Department of Energy organizations, the Office of Science and the National Nuclear Security Administration. Global Arrays Gets an Update from PNNL and Intel Corp.
Scientists Jeff Daily, Abhinav Vishnu, and Bruce Palmer, all from the ACMD Division High Performance Computing group at PNNL, served as the core team for a new release of the Global Arrays (GA) toolkit, known as Version 5.5. GA 5.5 provides additional support and bug fixes for the parallel Partitioned Global Address Space (PGAS) programing model. GA 5.5 incorporates support for libfabric (https://ofiwg.github.io/libfabric/), which helps meet performance and scalability requirements of high-performance applications, such as PGAS programming models (like GA), Message Passing Interface (MPI) libraries, and enterprise applications running in tightly coupled network environments. The updates to GA 5.5 resulted from a coordinated effort between the GA team and Intel Corp. Along with incorporating support for libfabric, the update added native support for the Intel Omni-Path high-performance communication architecture and applied numerous bug fixes since the previous GA 5.4 release to both Version 5.5 and the ga-5-4 release branch of GA’s subversion repository. Originally developed in the late 1990s at PNNL, the GA toolkit offers diverse libraries employed within many applications, including quantum chemistry and molecular dynamics codes (notably, NWChem), as well as those used for computational fluid dynamics, atmospheric sciences, astrophysics, and bioinformatics. Download information for GA 5.5. and the GA subversion repository is available here. In what is believed to be the largest study of its kind, scientists at the Pacific Northwest National Laboratory, Johns Hopkins University and their collaborators from institutions across the nation have examined the collections of proteins in the tumors of 169 ovarian cancer patients to identify critical proteins present in their tumors. By integrating their findings about the collection of proteins (the proteome) with information already known about the tumors’ genetic data (the genome), the investigators report the potential for new insights into the progress of the most malignant form of the disease. The work is published June 29, 2016, in the advance online edition of Cell [science paper not made available]. The researchers say their achievement illustrates the power of combining genomic and proteomic data — an approach known as proteogenomics — to yield a more complete picture of the biology of a cancer that accounts for three percent of all cancers in women and is the fifth leading cause of cancer deaths among women in the United States. “Historically, cancer’s been looked at as a disease of the genome,” said Karin Rodland, a senior author of the study and chief scientist for biomedical research at PNNL, a U.S. Department of Energy laboratory. The authors say that with the findings, researchers expect to be better able to identify the biological factors defining the 70% of ovarian cancer patients who suffer from the most malignant form of ovarian cancer, called high-grade serous carcinoma. Currently, only one in six such patients lives five or more years beyond diagnosis. The work draws on the efforts of physicians, scientists and patients who have worked together to understand ovarian cancer. The investigators say the effort requires collaboration among physicians as well as patients willing to take part in research to benefit others with the disease or even to prevent others from ever developing cancer. Under the leadership of the National Cancer Institute, scientists around the nation have worked together to create the Cancer Genome Atlas (TCGA), a collaborative effort to map cancer’s genetic mutations. The task for ovarian cancer was completed in 2011. In the current study, the PNNL and JHU teams each studied subsets of 169 high-grade serous carcinoma tissue samples and accompanying genomic and clinical data drawn from that study. The Johns Hopkins team initially selected 122 of the samples based on those tumors’ ability to repair damaged DNA — known as homologous recombination deficiency — and characterized by changes in genes including BRCA1, BRCA2 and PTEN, mutations long linked to increased cancer risk and severity. “We chose to examine these samples because patients with changes in these genes already are benefiting from a specific drug regimen for breast cancer, so if we could find similar changes in ovarian cancer genomes and proteomes, those patients would likely benefit from the same regimen,” said Chan, a professor of pathology and oncology at JHU. Chan is one of the inventors of the OVA1 ovarian cancer detection test, which is licensed to Vermillion Inc. of Austin, Texas. The PNNL team initially selected 84 samples based on overall patient survival times. “We examined the data for the shortest-surviving patients and the longest-surviving patients hoping to pinpoint biological factors associated with extremely short survival or better-than-average, longer survival,” said Rodland. Then, through their participation in the Clinical Proteomic Tumor Analysis Consortium (CPTAC), another program of the National Cancer Institute which funded both teams, the two groups combined their efforts. Using protein measurement and identification techniques based on mass spectrometry, the teams identified 9,600 proteins in all the tumors, and pursued study on 3,586 proteins common to all 169 tumor samples. While many people are familiar with the role our genes play in the development of cancer, the genes are often just a starting point, for patients and researchers alike. Genes are transcribed into RNA, the genetic material that makes proteins, which are the workhorses of cells. The activity of the proteins varies dramatically, with many undergoing changes that affect their impact and interactions with other proteins. A detailed look at the activity of proteins in cancer biology gives researchers insight into specific molecular events that would otherwise remain unknown. 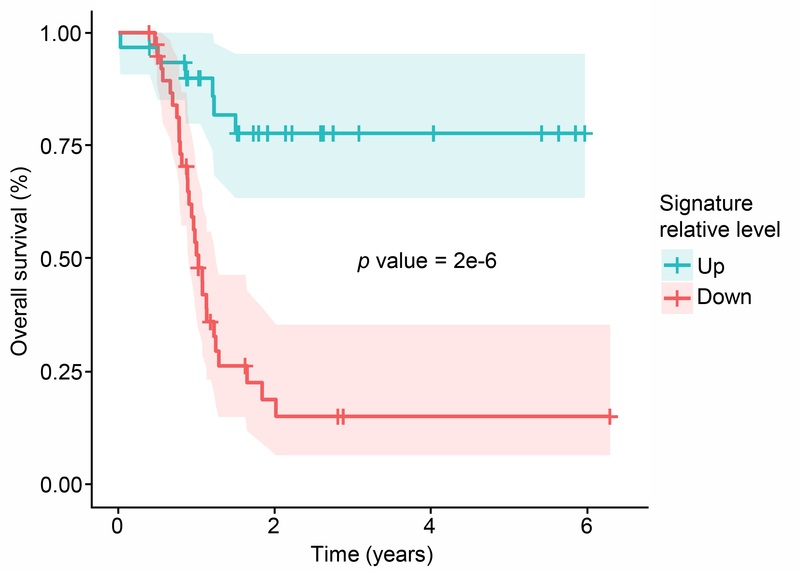 This figure illustrates the difference in survival between two small groups of women with ovarian cancer differentiated by a complex pattern of proteins in their tumors. These proteins are all affected by changes in the patient’s DNA. The group with greater expression of the signature proteins has an overall survival more than three times better than those in whom this particular set of proteins was less active. Scientists hope it will be possible to tailor a woman’s treatment for ovarian cancer based on the levels of such proteins once these findings are validated. The illustration hints at the complexity of the development of ovarian cancer. 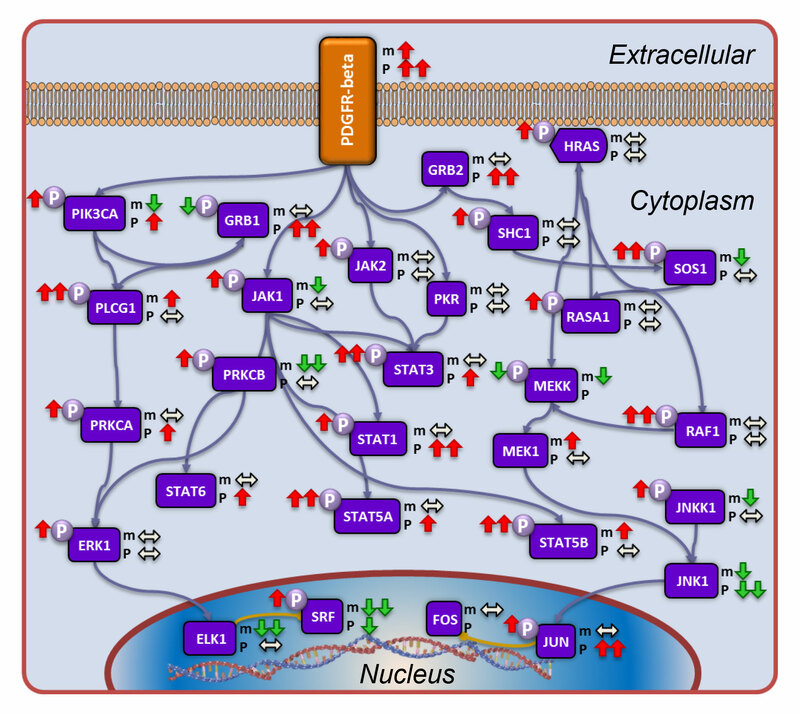 Each of the purple boxes signifies a particular protein, a cellular workhorse which affects other proteins and ultimately the behavior of a cell. Here, more than two dozen proteins are affected by a protein known as PDGFR, or platelet-derived growth factor receptor, which plays an important role in the formation of new blood vessels. The team showed that this molecule and its pathways are much more active in the tumors of patients with ovarian cancer who had short survival compared to other patients who lived longer than five years. A hallmark of cancer, and particularly high grade serous carcinoma, is when genetic instructions go awry. One form is the appearance of more copies of certain regions of the genome. These so-called copy number alterations can lead to changes in protein abundance. When the researchers compared known regions of copy number alterations, they found that parts of chromosomes 2, 7, 20 and 22 led to changes in abundance of more than 200 proteins. A more careful study of those 200 proteins revealed that many are involved in cell movement and immune system function, both processes implicated in cancer progression, the researchers said. “Adding the information about the proteome on top of the genome provides an entirely new dimension of information that has enabled the discovery of new biological insights to ovarian cancer, while creating a valuable resource that the scientific community can use to generate new hypotheses about the disease, and how to treat it,” said Rodland. In addition to large teams of scientists from PNNL and Johns Hopkins, contributors included colleagues from Stanford University School of Medicine, Vanderbilt University School of Medicine, University of California at San Diego, New York University School of Medicine, Virginia Tech, the National Cancer Institute’s Office of Cancer Clinical Proteomics Research, as well as CPTAC investigators. The proteomic analyses performed by the PNNL team were done at EMSL, the Environmental Molecular Sciences Laboratory, a DOE Office of Science user facility. The study compared two models of very large ions (macroions) that carry an electrical charge, and compared the results to experimental studies. On the left is a model of a cylinder with uniform axial charge density; on the right is the more complex (and useful) discrete charge model. Nucleic acids, large biomolecules essential to life, include the familiar double-stranded deoxyribonucleic acid (DNA), a very stable long molecule that stores genetic information. In nature, DNA exists within a solution rife with electrostatically charged atoms or molecules called ions. A recent study by researchers at Pacific Northwest National Laboratory (PNNL) proposed a new model of how B-DNA, the form of DNA that predominates in cells, is influenced by the water-and-ions “atmosphere” around it. Understanding the ionic atmosphere around nucleic acids, and being able to simulate its dynamics, is important. After all, this atmosphere stabilizes DNA’s structure; it impacts how DNA is folded and “packed” in cells, which triggers important biological functions; and it strongly influences how proteins and drugs bind to DNA. The research combines theoretical modeling and experiments in a study of ion distribution around DNA. It was led by PNNL physical scientist Maria Sushko, computational biologist Dennis Thomas, and applied mathematician Nathan Baker, in concert with colleagues from Cornell University and Virginia Tech. Earlier approaches have been used to simulate the distribution of ions around biomolecules like DNA. But only roughly. 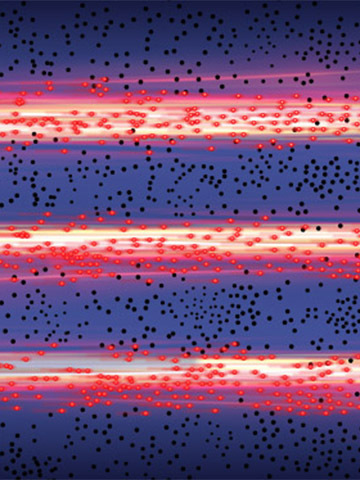 The PNNL-led study goes beyond commonplace electrostatics to propose a more refined but still computationally efficient model of what happens in these critical ionic atmospheres. “The main idea was to dissect the complex interplay of interactions, and to understand the main forces driving ions deep inside the DNA helix and the forces keeping them on its surface,” said Sushko, the paper’s first author. That interplay includes the correlation of ions within the solution, how they move, how they interact with one another, and how they interact with the DNA. The new model has two key advantages over older simulations: It allows researchers to turn ion-water and ion-ion interactions on and off at will. “We can calculate important interactions independently,” she said, a flexibility not present in previous simulations. And the new model is computationally efficient, allowing researchers to cheaply simulate a large-scale molecular event over a long time scale. The researchers confirmed that biological “correlation,” a measure of ion affinity, allowed DNA to pack more tightly by effectively neutralizing DNA’s electrostatic charge. Researchers also observed how ions get distributed through a solution, a water-ion interaction called solvation. The stronger the water-ion interaction, the larger the effective ion size, and therefore the less likely the ion was to settle in the DNA’s grooves. More strongly solvated ions, therefore, create a different environment for DNA folding. Only 15 to 20 percent of ions with double charges, which were strongly hydrated and strongly correlated, settled in DNA grooves. That showed a “very delicate interplay” of ion-to-ion and ion-to-water interactions, according to Sushko. Why It Matters: These results highlight important aspects of the properties of electrolyte solutions influencing the ionic atmosphere that impacts DNA condensation. This “packing” of DNA, which is otherwise one of the longest molecules in nature, is essential to DNA’s role in gene regulation. DNA condensation is also the key to protein binding and drug binding. It therefore points to practical applications in medicine and biotechnology. This research also highlights the impact of the ionic atmosphere on the interaction between biomolecules and a ligand: that is, the molecule, ion, or protein that binds with a protein or the DNA double helix for some biological purpose. Methods: Researchers employed two coarse-grained models to simulate the DNA macroion, which is a large colloidal ion carrying a charge. The goal was to capture two versions of detail on how ions spread out in a solvent and how they interact with simulations of DNA topology. 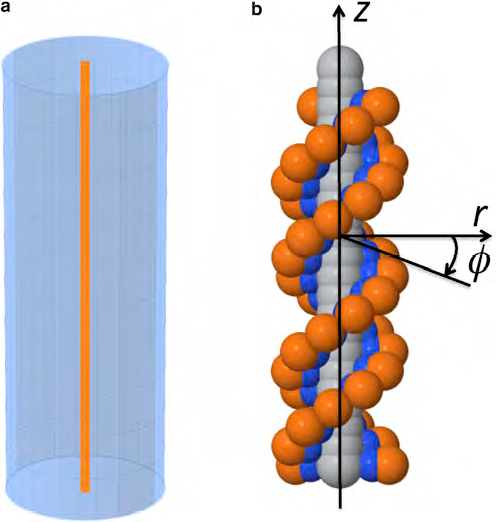 One DNA model posited an infinitely long cylinder with a uniform charge density along one axis. Sushko called it “a very crude model used a lot in the past. It explains quite a lot about ion interactions, but it is deficient in some ways.” The second, more complex “discrete charge” model posited three types of spheres in a helical array that mimics B-form DNA. It had a 3D-like character that allowed ions to penetrate into DNA grooves. The DNA simulations were run through four computational models of classical density function theory to assess the energetics of different ion-DNA interactions. Results were also compared to data from what Sushko called “state-of-the-art experiments” that used anomalous small-angle x-ray scattering. This technique, used to investigate the spatial dimensions of structures in the nanometer range, always yields a lot of detail about how ions are distributed around a biomolecule. But their more complex discrete charge model provided a much more naturalistic portrait of ion distribution in an ionic atmosphere. Its simulations showed ions both clinging to the helical DNA surface and also penetrating into the DNA’s grooves. 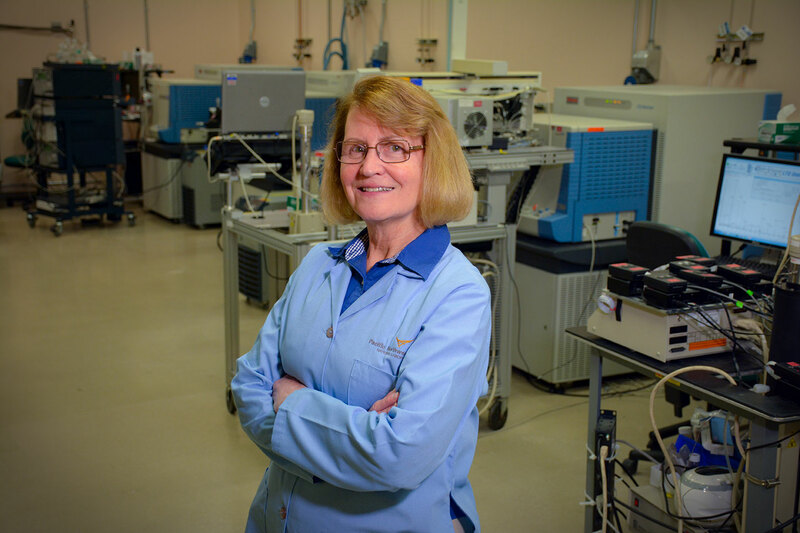 “The small details of ion penetration are very important for the way DNA will package the chromosome,” she said. What’s Next? Researchers plan to study the role of the ionic atmosphere in mediating interactions between DNA molecules. They also plan to extend their DNA model to include DNA sequence-specific effects, which often influence ion binding, and DNA sequence-dependent structural variations. While glass might be thought of in terms of holding wine or as a window, the stability of glass affects areas as diverse as nuclear waste storage, pharmaceuticals, and ice cream. Recently, chemical physicists at Pacific Northwest National Laboratory made a key discovery about how glass forms. They discovered that the temperature at which glass-forming materials are deposited on a substrate affects the stability. Their findings, published in The Journal of Physical Chemistry Letters, show the ability of a technique called inert gas permeation to tell at what temperature a solid “melts.” Their work brings more understanding to the fundamental properties of glass. Why It Matters: No matter how glass is made, understanding its properties is important. For example, the reason some medications have expiration dates is that their physical state changes from amorphous to crystalline. Once that happens, the medication doesn’t dissolve as readily when taken and is thus ineffective. Finding ways to increase its stability and effectiveness would extend its shelf life. Similarly, when nuclear waste is put into a glass matrix, the glass must remain stable to keep the radionuclides from being released. And as most ice cream lovers know, when you open a carton and see crystals have formed on the surface, it has lost much of its flavor. Methods: “Our research is fundamental work that could be important for stable glass manufacture by adding to understanding of liquids and liquid behavior,” Smith said. Glasses depend on temperature for stability. At the correct temperature, a glass remains stable because its molecules stay put. At warmer temperatures, it transforms into a supercooled liquid and then crystallizes. To create a glass, the materials must be cooled rapidly to a temperature low enough that the molecules don’t have enough time or energy to find the lowest energy configuration (a crystal). That temperature is called the glass transition temperature, or Tg, and it varies depending on the experimental conditions and the cooling rate. Smith and colleagues Dr. Alan May and Dr. Bruce Kay took the glass-forming materials toluene and ethylbenzene and super cooled them by depositing them onto a surface at 30 K. When the materials hit the surface, they formed an amorphous solid—a glass. The researchers then heated the sample. A layer of krypton deposited between two layers of glassy material (a sandwich) remained trapped until the glass transformed into a supercooled liquid (see Figure). The onset of gas release revealed at what temperature the glass transformed into a supercooled liquid. The researchers varied the material deposition temperature from 40 to 130 K. They observed that the stability of the glass depended on the deposition temperature. They found that for both toluene and ethylbenzene, deposition at a temperature a few degrees less than Tg, created the most stable glass-one that was the most resistant to turning into a supercooled liquid. These results are consistent with the calorimetric studies of Prof. Mark Ediger at the University of Wisconsin-Madison. “We found we can control one variable: deposition temperature. Even a difference of one Kelvin can result in years of difference in material lifetime and stability,” said Smith. Sponsors: This work was supported by the U.S. Department of Energy (DOE), Office of Science, Office of Basic Energy Sciences, Division of Chemical Sciences, Geosciences, and Biosciences. The research was performed using EMSL, a DOE Office of Science User Facility sponsored by the Office of Biological and Environmental Research and located at PNNL. Research Team: Scott Smith and Bruce Kay, PNNL; Alan May, Intel Corporation. Results: Around the world, researchers are studying microbes to see if these tiny organisms can be used to solve a host of problems, from cleaning up toxic waste to providing renewable energy. Unfortunately, attempts to develop biotechnologies often fall short because they focus on a limited set of single, highly engineered organisms. Such organisms frequently do not perform as efficiently or stably in an application as they do in the laboratory. Now, an internationally recognized group of scientists, organized by Pacific Northwest National Laboratory microbiologists Dr. Stephen Lindemann and Dr. Alexander Beliaev, has reviewed the state of the science to determine how biotechnological use of communities of multiple microbes, or microbial consortia, might transcend the limitations of single organisms. They posit that the time is ripe for design and control of microbial communities, and that achieving the ability to engineer microbial ecosystems will require a level of understanding of the mechanisms driving microbial community function only possible from combining recent advances in systems biology, computational modeling, and synthetic biology. These new perspectives stemmed from a panel at the 15th International Symposium on Microbial Ecology in Seoul and appear in the International Society for Microbial Ecology’s (ISME) official publication, The ISME Journal. Why It Matters: Agriculture has long known that monocultures, or growing only one type of crop, can be susceptible to changes in the environment. For example, relatively small or poorly timed changes in rainfall can cause major losses in production for some crops. In contrast, growing several crops with different tolerances to drought might more stably provide food, no matter the weather for a given year. The same principle applies to microbes, which are drivers of global geochemical cycles and catalysts for renewable fuels and chemicals. Microbial communities can prove to be more reliable than engineered “superbugs” and more robust against unpredictable environment than individual microbes. This reliability is the key to using them for industrial purposes. Methods: Seven scientists from PNNL, Montana State University, Fred Hutchinson Cancer Research Center, and the Swiss Federal Institute of Technology brought perspectives from different scientific approaches, research programs, and countries to analyze the state of the science. They used questions posed by experts who attended the ISME symposium to outline key issues. Drawing on their years of experience and amassed knowledge, the group determined that successful biosystems design is contingent both on the understanding of microbial physiology and accuracy of computational models that describe how organisms interact. An iterative design-build-test approach that can predict interspecies dynamics and analyze energy and material flows in a community will help scientists better understand how these consortia can be used for biotechnologies. What’s Next? PNNL’s microbial research program continues to expand the foundation of biological systems design. Ideally, advances in this field will allow scientists to control safety, productivity, and stability of natural and designed microbial ecosystems. Sponsors: The U.S. Department of Energy’s Office of Science, Office of Biological and Environmental Research, supported this work via the Genomic Science Program under the PNNL Foundational Scientific Focus Area. MWF is supported by the Scientific Focus Area Program at Lawrence Berkeley National Laboratory. HCB participated with support from the Linus Pauling Distinguished Postdoctoral Fellowship, a Laboratory Directed Research and Development Program at PNNL. Research Team: Alexander S. Beliaev, Hans C. Bernstein, Jim K. Fredrickson, Stephen R. Lindemann, and Hyun-Seob Song, Pacific Northwest National Laboratory; Matthew W. Fields, Montana State University; Wenying Shou, Fred Hutchinson Cancer Research Center; and David R. Johnson, Swiss Federal Institute of Technology. Reference: Lindemann SR, HC Bernstein, H-S Song, JK Fredrickson, MW Fields, W Shou, DR Johnson, and AS Beliaev. 2016. “Engineering Microbial Consortia for Controllable Outputs.” The ISME Journal: Multidisciplinary Journal of Microbial Ecology. Advance online publication 11 March 2016. DOI: 10.1038/ismej.2016.26. Microbes in the soil are central players converting carbon into greenhouse gases. Microbes in soil — organisms that exert enormous influence over our planet’s carbon cycle — may not be as adaptable to climate change as most scientists have presumed, according to a paper published March 2 in PLOS One. The finding means that a big piece of the puzzle regarding the future climate of our warming planet just got a little tougher to fit into current computer models. Soil holds an enormous pool of carbon — in a forest, for instance, usually there is more carbon beneath the surface than in the trees above — and what happens to that carbon is an important factor in the future of our planet. Bacteria, fungi and other microbes are central players, converting carbon and other elements in the soil into carbon dioxide and other gases that are expelled into the atmosphere. “Soil is the major buffer system for environmental changes, and the microbial community is the basis for that resilience. If the microbial community is not as resilient as we had assumed, then it calls into question the resilience of the overall environment to climate change,” said author Vanessa Bailey of the Department of Energy’s Pacific Northwest National Laboratory. The findings are based on a unique 17-year study of transplanted soils on a mountain in eastern Washington state. The team moved some samples of soil down the mountainside 500 meters to a warmer, drier climate, and other samples up 500 meters to a cooler, moister climate. After 17 years, they analyzed both sets of soil in the laboratory, as well as “control” samples from both sites that had never been moved. The scientists analyzed the make-up of the microbial communities, their enzyme activity, and their rates of respiration — how quickly microbes convert carbon in the soil into carbon dioxide which is released to the atmosphere. The scientists found less adaptability than they expected, even after 17 years. While the microbial make-up of the samples did not change much at all, the microbes in both sets of transplanted soils retained many of the traits they had in their “native” climate, including to a large degree their original rate of respiration. The message, the authors say, is that scientists can’t simply assume that microbes will nimbly respond to climate change. “The fact that the soils’ native environment continued to exert profound influence on microbial activity 17 years later is quite surprising,” said co-author Ben Bond-Lamberty, a scientist with the Joint Global Change Research Institute, a partnership between PNNL and the University of Maryland in College Park, Md. “We can’t assume that soils will respond to climate changes in the ways that many scientific models have assumed,” Bond-Lamberty added. In their study, the PNNL scientists took advantage of a mountain location where the climate changes quickly as one moves higher. Just 500 meters up the mountain, temperatures cooled about 5 degrees Celsius on average and rainfall increased about 5 centimeters annually. That translates to more vegetation at the higher location and thus more carbon available to microbial communities. The microbes native to the higher site respired at a higher rate naturally, due to the moister climate and a more plentiful supply of carbon in their environment; when they were moved to the lower, warmer site, they continued to respire at a faster rate than the surrounding “native” soils and microbes. And the microbes transplanted from lower ground to higher ground had an unusually small response to the temperature change, though biological theory and climate models predict a larger change. The study was funded by the Department of Energy Office of Science. Measurements of various forms of carbon were done at EMSL, the Environmental Molecular Sciences Laboratory, a DOE Office of Science user facility at PNNL. Reference: Ben Bond-Lamberty, Harvey Bolton, Sarah Fansler, Alejandro Heredia-Langner, Chongxuan Liu, Lee Ann McCue, Jeffrey Smith, Vanessa Bailey, Soil respiration and bacterial structure and function after 17 years of a reciprocal soil transplant experiment, PLOS One, March 2, 2016, DOI: 10.1371/journal.pone.0150599. The bacterium Chloroflexus aurantiacus helps give the greenish color to this pool of water in Yellowstone National Park. Microbes need their vitamins just like people do. Vitamins help keep both organisms healthy and energetic by enabling proteins to do their work. For bacteria, a dearth of vitamins can spell death. Now scientists at the Department of Energy’s Pacific Northwest National Laboratory have made a “vitamin mimic” — a molecule that looks and acts just like the natural vitamin to bacteria, but can be tracked and measured by scientists in live cells. The research offers a new window into the inner workings of living microbes that are crucial to the world’s energy future, wielding great influence in the planet’s carbon and nutrient cycle and serving as actors in the creation of new fuels. Vitamins are a powerful currency for researchers seeking to compel microbes to give up their secrets. “We have a lot to learn about how microbes accumulate and use nutrients that are necessary for their survival and growth. This provides a window for doing so,” said chemist Aaron Wright, the corresponding author of the study published in ACS Chemical Biology. “Perhaps we will be able to make a microbial community do what we want, by controlling its access to a specific nutrient,” Wright added. To control the bacteria via vitamins, Wright and his team have to know what other proteins in the cell the vitamins are consorting with, and where and when. Think of a planner analyzing emergency services for a large city. Knowing that an ambulance enters the city occasionally and transports some people somewhere, for instance, is not nearly as useful as knowing the precise address of the caller, the identity of the injured, and the location of the nearest hospital. It’s the same for scientists trying to understand microbial cells. While a cell is infinitesimally small, the activity within resembles the hustle and bustle of a large city, with many functions within carried out by thousands of entities. Knowing precisely which vitamins aid which proteins, under what circumstances, to keep things running is a must if scientists are to maximize microorganisms for energy production and other processes. Wright’s team studied the bacterium Chloroflexus aurantiacus J-10-fl, which is a common member of microbial mats — gloopy natural structures (think pond scum) where layers containing different groups of microbes band together. In these collections, C. aurantiacus often plays the role of anchor, helping to hold together an assortment of microbes. The bacteria, which resemble strands of string under the microscope, are usually found in hot springs, since they enjoy temperatures above 100 degrees Fahrenheit. Wright’s team performed a series of synthetic chemical steps to alter three vitamins that C. aurantiacus needs to survive: vitamin B1 (thiamine), vitamin B2 (riboflavin), and vitamin B7 (biotin). While the bacteria recognized the substances as normal vitamins, the researchers can monitor the mimics much more easily than their natural counterparts. Wright’s team used the mimics to relay a treasure trove of information about how vitamins enter the cell and interact within the cell, by analyzing the precise location of the molecules’ activity in living cells. Through a system called affinity-based protein profiling, Wright’s group effectively tagged these molecules where they’re active, then used techniques such as mass spectrometry to sort and measure proteins of interest. One of the team’s findings suggests multiple vitamins may share the same molecular machinery to gain entry into the cell. The team is still investigating these data. These findings can provide a road map for scientists like Wright who are trying to direct microbes as part of broad efforts to create clean, renewable fuels and reduce the effects of climate change. 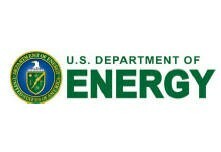 The work was funded by the U.S. Department of Energy Office of Science. The mass spectrometry-based measurements and microscopy were performed at EMSL, the Environmental Molecular Sciences Laboratory, a DOE Office of Science User Facility at PNNL. Reference: Lindsey N. Anderson, Phillip K. Koech, Andrew E. Plymale, Elizabeth V. Landorf, Allan Konopka, Frank R. Collart, Mary S. Lipton, Margaret F. Romine and Aaron T. Wright, Live cell discovery of microbial vitamin transport and enzyme-cofactor interactions, ACS Chemical Biology, Dec. 15, 2015, DOI: 10.1021/acschembio.5b00918. EMSL, the Environmental Molecular Sciences Laboratory, is a national scientific user facility sponsored by the Department of Energy’s Office of Science. Located at Pacific Northwest National Laboratory in Richland, Wash., EMSL offers an open, collaborative environment for scientific discovery to researchers around the world. Its integrated computational and experimental resources enable researchers to realize important scientific insights and create new technologies. Follow EMSL on Facebook, LinkedIn and Twitter. Imagine having solar panels turn out fuel, essentially storing the sun’s energy for a rainy day. Scientists are searching for a material that can handle the job. The material must excite electrons when struck by sunlight, easily transport the electrons to where they are needed, and use those electrons to create fuel—and, it must be a material that isn’t in short supply. Rare metals such as platinum need not apply. Hematite, an oxide of readily available iron, is a popular choice. It meets all the requirements but one—it doesn’t let the electrons zip along. Dr. Tiffany Kaspar at Pacific Northwest National Laboratory and her colleagues may have found a way to let the electrons flow—by layering on the oxide of another abundant metal: chromium. 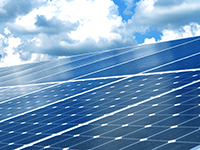 Why It Matters: Solar energy must be used when it is generated, or it is lost. Storing the energy as fuel could allow solar power to play a larger role on the nation’s energy stage. In the simplest case, solar energy would split water, H2O, to generate hydrogen, H2, fuel. This work shows how one of the challenges to solar fuels could be overcome with earth-abundant minerals. This work also shows how abrupt interfaces between hematite and chromium oxide can be controlled in such a way as to move the electricity without requiring added energy. Methods: When you shine light on hematite, electrons are excited, leaving behind “holes,” which act as the positive charge to the electron’s negative charge. Unfortunately, in hematite the electrons tend to fall back into their “holes.” If the electrons and holes could be quickly separated after the electron was excited, both could move on. Ideally, the holes would migrate to the material’s surface, where they can catalyze the production of fuel. To create a material where the electrons and holes are forced to separate, the team produced an artificial crystal structure called a superlattice. The team built a thin layer of hematite and then added a layer, three atoms deep, of chromium oxide. They added another layer of hematite, and then chromium oxide, like stacking up the layers on a cake. The abrupt interface between each distinct layer is key to separating the electrons and holes: the electrons prefer to remain in the hematite, while the holes are driven to the chromium oxide layers. The layers were created using the molecular beam epitaxy instrument at EMSL, a DOE scientific user facility. Now, when light strikes the surface of the superlattice, the interfaces are such that they drive the excited electrons to the hematite and the holes to the chromium oxide. As an added benefit, the superlattice stack generates an internal voltage that is epxected to drive holes to the material’s surface, where they can react to create fuels. The ability of these superlattice stacks to separate electrons and holes was first predicted in 2000 by Kaspar’s colleague Dr. Scott Chambers, but no practical applications were envisioned at the time. Further study led to an understanding of the interfacial properties between the hematite and chromium oxide layers. This work proved relevant to the recent interest in using hematite to produce solar fuels, prompting Kaspar and colleagues to create and test the superlattice stacks. What’s Next? Kaspar and her team are now conducting photoelectrochemical studies to take the next step: split water to produce fuel.